Interviewer: Julie, what is the name of your organization? JV: Branding is very important to me and therefore, I have approached the subject with great care. For starters, I am the president of The Higgins Group, and we are a Christie's International affiliate. Rick Higgins is the founder, broker, and CEO of the company. Within this framework I am also the president of Vanderblue Associates and the President of The Vanderblue Team. Interviewer: Please walk me through this branding complexity. JV: Rick Higgins early on identified me as an executive who could help grow The Higgins Group. We now have 14 offices throughout Fairfield County Connecticut. He believed, and I agreed, that having me help with company recruiting, training, leadership, and overall growth would be mutually beneficial, and it has been. Interviewer: How does this coincide with your other titles and responsibilities? JV: The next title, President of Vanderblue Associates, is the name that oversees my own Vanderblue Team, and smaller teams which decide to work under the umbrella of Vanderblue Associates. Vanderblue Associates can also extend to other partnerships I form related to real estate. Interviewer: This sounds a little like the Father, Son and Holy Ghost to me, if you will forgive my Catholic Church background. Isn't this confusing to others? JV: Not in the least for the following reasons. Although Rick appointed me President, that is a title that I very seldom employ. Although I am constantly committed to our company growth, this is much more of Rick's domain, with me devoting virtually all of my time to Vanderblue Associates and my Vanderblue Team. As anyone who knows me would attest, I never introduce myself to anyone as the president of anything, and instead merely Julie. Therefore, these titles are much more resume relevant than every day announcements. Interviewer: How much of your focus is on the company, versus the associates, versus your team? JV: Great question. The overwhelming percentage of my time is devoted to the development and needs of the members of The Vanderblue Team and the servicing of all of our clients needs, including mine. Interviewer: What is the difference between The Vanderblue Team and Vanderblue Associates? JV: Vanderblue Associates is the umbrella that both The Vanderblue Team and other small independent teams work under. Interviewer: Why wouldn't you just have these smaller teams fold into The Vanderblue Team? JV: Because they are led by a team leader who wishes to grow their personal and individual team brand and are usually further geographically than my core team members. However, they want to benefit through associates with the Vanderbluebrand and all of the marketing, training, and support services associated with Vanderblue. Interviewer: Since you acknowledge that the majority of your focus is on The Vanderblue Team itself, let's now turn to how The Vanderblue Team came about, starting with you, Julie. What is your background, how long have you been in the business, and why did you enter real estate? JV: My background includes personal and professional time both in and out of Connecticut, but the majority of my life has been right here in my great home state. I graduated from the University of Connecticut with a degree in marketing. During college over a number of small college related businesses. After college I worked in California and Colorado, both an advertising as well as starting my own business called Julie's Java, which ended up as five small coffee shops throughout ski country. Interviewer: You meant you were Starbucks before they existed. JV: I wish. But it was a great experience and satisfied my entrepreneurial cravings. Interviewer: Why did you move back to Connecticut? JV: I miss my family in Connecticut. At that time, I was working in advertising design and helping small businesses create marketing strategies including branding, text, and placement. Interviewer: How did you switch to real estate? JV: Well, The best part of moving back to Connecticut with my meeting and then marrying Thor Vanderblue. By the way, my maiden name was Julie Trotta. Thor was in is a high-quality luxury builder. After seeing the way that realtors were marketing his and other people's properties, and especially given my degree and experience in marketing, I decided this was an opportunity for me to leverage my background. Interviewer: How many years ago was this? Interviewer: How did you take to your new field? Interviewer: It seems as though your background as a marketing executive and your natural networking skills were far in advance of either your administrative or time management skills. JV: These first two hires build a foundation for what would grow during my Ravies years to a team of eight people doing well in excess of $120 million in production. Interviewer: Why did you leave a highly respected company led by an industry giant, given that your team was producing over $100 million? JV: Because back then I found that my vision and the culture I wanted to create involved conflict with the vision of the company. Interviewer: Well, as a local legend in Fairfield County and having developed a most impressive team, you could have moved anywhere. Why the Higgins Group? JV: In two words - Rick Higgins. I thought when I met him that Rick was the most humanistic, collaborative, gentle, and caring person I had ever met in real estate. Over the past 14 years or so, this feeling I had has only grown into an absolute fact. Beyond these personal qualities, Rick is an Ivy League graduate, former attorney, and a builder. What a background! Rick convince me then, and he still convinces me today, that he will do everything to support both individuals and teams. And he does. Interviewer: How big is the Higgins Group? JV: We have 14 offices in southeastern Connecticut, principally in magnificent Fairfield County with offices from Greenwich through Bridgeport. Interviewer: When you made the transition how many of your team members moved over with you? Interviewer: Let's now move more to the present. How many people are on your team know and how much business are you doing? JV: Beyond my administrative and marketing support, which consists of three full-time people, the Vanderblue Team consists of a core group of 10 full-time professionals. Regarding production, let me first say that we are coming out of several years of a market downturn. In spite of this, we have consistently produced in the $125 million range. But this year we have doubled our team to 20, and I project that we will do approximately $200 million over the next 12 months. Interviewer: How do you go about selecting the right people for your team? Do they predict a capacity for teamwork and overall collaboration? For this I look for a background of sports or group participation. Can they bring specialized skill or interest? 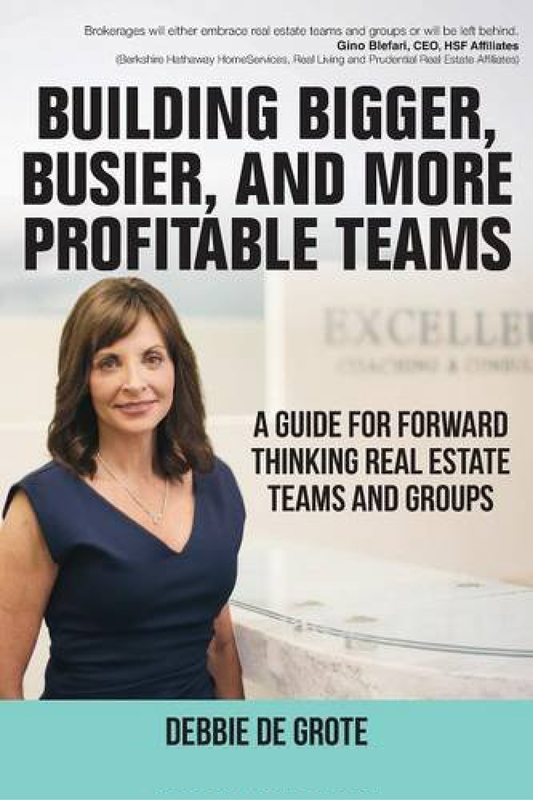 For example, although I encourage all team members to also be listing and selling generalists, I look for specialties such as first time buyers, investment properties, horse properties, luxury marketing, distressed properties, etc. This way the sum of all of our parts also defines a team in the way reminiscent of a medical group. Geographical coverage as well as geographical team balance. Candidates who have displayed a propensity for community involvement. And of course, another important other factor is a background of success with special emphasis on them having an attraction to selling. Interviewer: How often does your team meet and can you describe what you look to accomplish at these meetings? JV: We meet religiously each and every Monday morning for the entire morning. At these meetings, I like to have different team members lead the team meeting. We cover all of last weeks activities, market trends, open house traffic, results from the weekend, training issues, as well as possibility thinking and individual and team strategizing. We carefully assess all of our lead generating programs, advertising, and our marketing as well. Interviewer: Can you give me an example of a distinctive marketing program that you might discuss at your meeting? JV: A great example is the Vanderblue Team Exclusive Sneak Preview program. This is our highly publicized marketing program which is expressly design for homeowners who have to sell before they buy, and who wish to test the market by hosting a private showing to highly prepared buyers and key rainmaking realtors. This enables our clients to make the necessary staging and pricing adjustments, not just based on the suggestions of one of our team members, but instead we provide real-time and more expensive intelligence regarding their property's appeal relative to price. We have to take the time to review and train our people in a program like this. Does the sneak preview program limit competition and exposure, and therefore hurt our sellers? What we have learned and what we teach is twofold. First of all, we need to be completely transparent, have a waiver of cooperation form signed, explain how we will initially be trading off full and general competition for a brief period of smaller but more intense competition, and make sure all pros and cons are discussed. Second, this program must also invite and include other companies and their agents, as long as they know that there will be a sneak preview period prior to going on the full market. Interviewer: As a full marketing exposure individual, I must say I respect how you position this option your clients. JV: It's amazing how buyers act differently when they know they have a one time chance. Typically, our properties go very shortly to full market, but our clients who need to sell fast, yet at a strong price, or who want some test marketing first, love this program. Interviewer: How much of your marketing and technology is Vanderblue generated versus Higgins? JV: Almost all of it. I pay for Zillow, Trulia, Realtor.com, Top Producer, and encourage team members to invest more into their careers on top of this. Interviewer: What makes your team distinctive from other teams? Interviewer: Give me some examples. JV: When it comes to community participation, charity work, community educational seminars, event marketing, and merchant partnerships, I have never seen any company of our size as prolific as we are in this area. I could fill a book myself on these programs and efforts. In fact, if any of Debbie's and your readers wants to learn of all we do they can email me. Interviewer: What is this merchant partnering you've just mentioned? JV: Most of my Vanderblue Team local advertising, brand building, and personal promotion are completely subsidized by strategic merchant partners. I would also be happy to share copies of these ads and marketing pieces. Interviewer: I see on your website you refer to AIRE. Please explain what this is. JV: AIRE stands for All Inclusive Real Estate. Given my marketing background, I always pay close attention to what consumers are asking for, and as all team leaders know, both buyers and sellers are always asking me and my VanderblueTeam members to recommend real estate and lifestyle related merchants and professionals. Interviewer: You mean full service, one stop shopping real estate. JV: No, not in the hackneyed, limited, and stereotypical way in which some in our industry have confused this. Interviewer: What do you mean confused? JV: It's simple. Some real estate companies asked themselves, "What can we sell that will make us the most amount of money? We will call that one stop shopping or full service." Specifically, they would start their own mortgage and escrow companies, and this profiteering opportunity meant, to them, one stop shopping or full service. Interviewer: And what is wrong with this? JV: Many real estate agents are uncomfortable steering buyers to their own company's mortgage, title or insurance sector, as they know that often times their company has ownership in these companies. Interviewer: And how is AIRE different? JV: One, we do not own any of the dozens and dozens of businesses we recommend. Secondly, full service means extending the service menu to much more than the transaction. Our team wants to endorse merchants and professionals who we carefully vet both before, during, and long after the transaction. Interviewer: You also mention community. Elaborate please. JV: Every town and city in our market is distinctive, and homeowners appreciate how our Vanderblue Team has created world class videos that deliver the most powerful reasons to move to that town or community. On our site we have links to videos on each of these towns and town specific websites, whereby local homeowners and residents in general can post reviews. Interviewer: Julie, how do you train your team? JV: We include training in our Monday morning meetings. I am constantly training my team on how to make a VanderblueTeam related marketing presentation to homeowners and I am constantly training team members in the field. This is all in addition to the very effective training Rick Higgins provides all Higgins agents an teams. Interviewer: How do you find the time for all of this? As I understand, you occasionally teach at Bridgeport University? JV; I have a great team that cares about me, as I care about each of the,. Because of this I am able to take vacations to Norway each year, the homeland of my husband Thor, and a number of other precious family vacations. Plus, when you love your business, your team, your company, your industry, your community and most of all, your family, you never complain about how hard you work. And I never do. Interviewer: Well, given the demands of your time, on behalf of Debbie and myself, thank you for contributing to Building Bigger, Busier, and More Profitable Teams.